Summer is a time for home improvements and, since school is out, a busy time for moving. Thanks to wireless home alarm systems, you can easily move and reinstall your security system as a result of your renovations or relocation. I recently moved to a new city and thus needed to bring my Protect America system that I recently self-installed with me. Here are some easy to follow steps and tips for moving and how to make the most of your relocation. This time, I put my husband to the test to compare his process with mine while observing and documenting his experience. 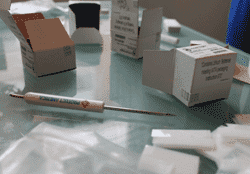 Keep the original packaging – In hindsight, you might have already tossed the packaging out. It’s not a must, but it does make it easy to keep your sensors and pieces labeled and easy to find. And since many of the pieces are small and could get lost in the transition, it’s good to have a place to keep them all together in one place. You could also use a rubber band or Ziploc baggies to keep pieces together. Remember that replacement of these sensors and other equipment could get pricey if you do not take the necessary precautions. Call your monitoring company – In my case we called Protect America to let them know we would be moving. Not only do they need to update the address on your account and for monitoring (if you’re relocating), but they’ll also walk you through the steps to take and answer any questions you might have. Request a moving packet – A tip I didn’t know until I talked to the customer service rep at Protect America, but they sent me a moving packet complete with new Velcro adhesive for the sensors and new security stickers. It also came with a tool that came in handy during the re-install. Revaluate your home security needs – Your customer service rep should ask you, but be prepared to know what needs you’ll have in the new home. 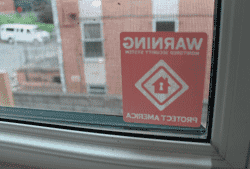 Will the windows be double locked and thus no need for sensors but perhaps glass break sensors instead? Do you have more or fewer points of entry? Are you on a single level or multi-level home? Will your new home have a garage? Take the opportunity to determine what’s working and where there are areas for improvement. Turn off the backup battery in the interim – We made the mistake of learning this the hard way. After unplugging the unit from the wall and removing the AC adapter the control panel continued to beep. We put it in the back of the U-Haul so it wouldn’t annoy us. By the time we made it to the new place, it had stopped beeping, but it turns out, after we plugged it back in, that the back up battery is now low, probably drained from the long time it was unplugged (and beeping). The backup battery is there as a safeguard if your power should go out. Luckily, the installer on the phone heard the “low battery” alert and is sending us a new back-up battery. Remove the adhesive/hardware – As a courtesy to the future tenants it’s a good idea to go ahead and peel off or take down the backing from the sensors and patch up any areas where the home security system was previously installed. The adhesive we used was very strong but barely made a mark on the doors and windows where we had them installed. And, the newer sensors came with a new 3M sticker versus the Velcro which we preferred because it is more permanent and looks more flush with where it’s installed. 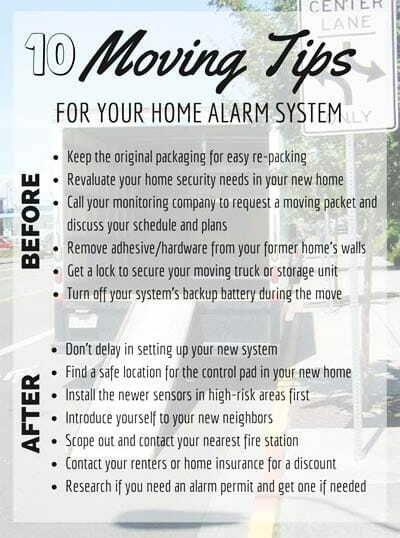 Don’t delay – Every day without a home alarm system is another day you are more vulnerable to a break in. Make it a priority and put on the top of the list to get your home protected. Especially since new residents are targets for break in. Moving boxes in the trash (and a U-Haul parked out front) signal there are new neighbors on the block and you could be easily taken advantage of. Scope out a location for your control pad – As you might know, the control panel or “the brain of your alarm system” doesn’t need to be, and shouldn’t be, in a place where the intruder could easily get to it. A good place to keep it might be a home office, kitchen counter or closet with a plug. You need to make sure the antenna has a strong signal if your monitoring is cellular. Lay out everything you need before you call (as pictured) – I did this during the initial install and it saves you time on the phone to get exactly what you need and have all the items ready when you are talking with the installer. Especially since you are holding a phone while you are installing. Install the newer sensors in the high traffic or high-risk areas first – Not only are the new sensors more sensitive because their batteries are fresher, but by placing them in high traffic areas you have the most susceptible places addressed first. This way you are covered in case anything happens to the new sensors, something goes missing in the move, or additional entry points come up that you haven’t thought of. We had one sensor that needed to be replaced but luckily it’s in a place in the back on the second level so we’re glad that the front door and front windows are covered while we wait a day or two for the new sensor to arrive. Consider removing the delay if you have one – We had the default option of a 45 second delay for deactivating the alarm. Since we have a smaller place, and the keychain remotes or interactive app on our phones to quickly deactivate without the keypad, the installer recommended we remove this time delay as it gives the burglar a 45 second head start on getting into your belongings. Burglary statistics show that the majority of burglars are in and out of your home in 8-12 minutes, so 45 seconds is quite a bit of time for a burglar to go to work on a small apartment. Embed this infographic on your own site using the short code below. Introduce yourselves to your new neighbors – In addition to being courteous, it’s good to know your neighbor so you can help each other keep an eye on things and any suspicious activity. Exchange contact details as well as emergency contact information and let them know if and when you might be going out of town for an extended period of time. Although you have a home alarm system to protect you, it doesn’t hurt to have a second pair of eyes on your home. Scope out and and contact your nearest fire station – This is important, especially if you have a fire sensor, to notify them of your situation. They will need to know that you have a monitored fire and/or smoke sensor. Contact your rental or homeowners insurance for a discount – When I originally set up our renters insurance we didn’t have a home alarm system and never thought to let them know. So when I called them to update our address and get a new quote they asked me about having a monitored security system and smoke detector in our new place. We have both and as a result we got a massive discount on our monthly premium. That alone comes close to paying for the home alarm system itself in our case! I was pleasantly surprised to know this and highly encourage anyone with a home alarm or monitored smoke detector to notify their insurance company to see about any additional discounts to rental or homeowner’s insurance. Having just moved across the country, I thought I’d share some additional advice for those of you looking to relocate. Take just what you need – Start going through all your stuff and think about the absolute musts. What can you get rid of or do without in the short term until you relocate? Make piles for donate/sell and keep/move. It’s difficult at first to let go but you’ll feel better and won’t miss the things you are getting rid of. Storage is also a good option for when you want to hold on to things like wedding dresses, baseball cards, etc. but don’t need to use everyday. Plan more time than you think – You might be optimistic about how quickly the process will go and anxious to get to your destination, but be sure to allow for extra time for the unexpected and unknowns that could arise. You never know if it will rain on moving day or if you’ll encounter traffic in-route to your final destination. You’ll also want to take breaks, pit stops and breathers along the way. Better to be safe than sorry. Small boxes for heavy stuff. Large boxes for light – It might seem like there’s a ton of room in those big boxes, but think about how heavy and/or awkward it will be to carry. Save big boxes for pillows, bedding, pots and pans. Split the books, clothes and heavier items into several smaller boxes. Group all your boxes into one area if possible (like an empty room or a garage) – This will help you get a sense for how much space you have left for the bigger furniture and how much room you’ll need on a moving truck. Reserve moving trucks early – Especially during high peak moving seasons like May – August. Pack the “big rocks” first, the “small peoples” last – Get the major things and must go’s on the truck first, then any of the lightweight or “nice to haves” last. Those can always be shipped or donated if need be. Then, once you get there, you should be unpacking the lighter weight, smaller stuff first since you packed those last. This helps to work your way up to the big stuff, especially after a long drive. Don’t forget moving insurance and/or a pad lock for your precious cargo – Check with your current renters/homeowners or auto insurance policy to see if you can add on a rider for your move. The moving company can often provide one as well. Worse case, get a good padlock and keep your stuff locked inside the moving truck. Take advantage of the U-Haul while you have it – Make a trip to Ikea, go buy new furniture, most U-Haul rentals are up to 6 days in one flat rate so if you can make use of the extra cargo space while you have it, go for it! How Did the 2nd Security System Install Measure Up? It took my husband approximately the same amount of time to reinstall the system as it did for me to originally install it. Approximately 45 minutes, which is pretty good considering we had more sensors this time around and he had both new and old sensors to test. His first reaction when he hung up the phone was “Wow, that was easy!” He was also extremely impressed by how flawless the process was and amazed with the ability for their systems to communicate with ours so quickly. He had nothing but great things to say about how knowledgeable the Protect America installation specialist was. She knew exactly what to do and was helpful and reactive to every situation and issue that arose during the installation process. My only criticism in the process this time was that I feel they didn’t take the time to understand our new home security needs based on the new property. When I called to request more sensors they tried to sell me on a package, without knowing first what our new apartment was like. Since every person’s home is unique I think there should be more of an emphasis on the customized experience and more questions asked upfront to better assess each unique home situation. For instance, we now live on a second story with double locking window panes so it is much more difficult to open the window versus break it so we should probably have glass break sensors instead of window sensors. Other than that, the alarm move was easy as can be and having a completely wireless system allowed for less headaches, no holes in the wall and no need to schedule an installer to come to our property. As always, don’t forget to put your sign up and stickers in your windows (maybe even do this first thing!). It alerts all potential intruders to stay away before even attempting a break in. Now you can brag to the world and let everyone know you are living a secure life. 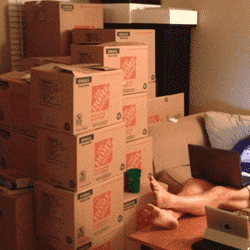 Have You Moved Recently? Let us Know What You Think! Have you ever moved or gone through the security system reinstallation process? Let us know by commenting below on how your experience went and if you have any additional tips you think would be useful for our readers! Who knows, we might just add your tips to this article!